When I bought my Mac Pro last year I used it to replace my Windows XP system. Since I already had a great pair of Samsung 204B displays and a Logitech Mx510 Gaming Mouse that I really liked I figured I’d just keep using them. I personally couldn’t stand the Apple Mighty Mouse – I love all the buttons I get on the Logitech too much and with SteerMouse I could customize it as much as I liked. The swapping of the the two keys between the Control and Space Bar means a lot of fumbling for different keys, especially for a heavy keyboard user like me. Since I’ve now ingrained into my hands the physical location of the keys I decided to give my old Microsoft keyboard a whirl. I became addicted to Microsoft ergonomic (split) keyboards nearly 10 years ago and have owned a variety of different versions over the years. My latest one is a Microsoft Natural Ergonomic Keyboard 4000. While the name is unwieldy the keyboard itself is a joy to touch type on. With a raised wrist rest and natural feeling home position for my fingers I can very easily drop my fingers to the keyboard without looking and just type away. This was not the case with the Mac’s aluminum keyboard; if I pulled away from it to grab the mouse I didn’t always drop on the right key position; the tiny indentation on the F and J keys were easily passed over. That’s not the case with a split keyboard. Your hands have a tendency to just fall right into place because of the angle for the keyboard. The split in the middle mimics the angle your arms approach the keyboard and the keys themselves are not laid out in a straight line; they curve gently to mimic the reach of your fingers. I dusted off the keyboard and plugged it in to one of my USB ports. The Mac Pro couldn’t figure out which keyboard it was and asked me a couple of questions but after that I was able to get it up and running quite easily. I was shocked to see how quickly I could type on it compared to the aluminum keyboard, especially when I was jumping between tasks. 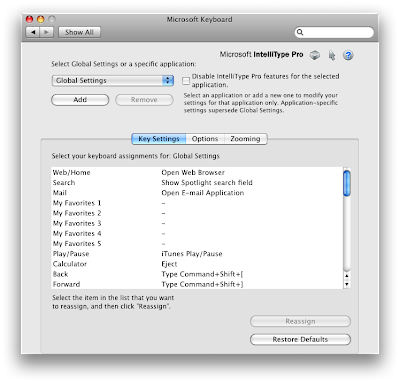 While this worked fine there was one other little quirk; the Microsoft Natural Keyboard doesn’t have an eject key. There are tons of extra keys on this baby but an eject button just wasn’t a requirement. Now that I have my keys mapped properly I am ripping through work like crazy and typing faster than ever. 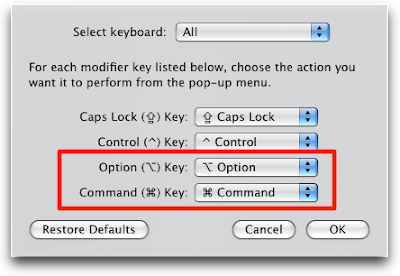 The only downside is that I have this little Windows Start key sitting there that I would like to have labeled Alt / Option–which is what it actually does–and the Alt key should be named Command. Since each key on this keyboard is custom fit they aren’t interchangeable. It appears a Bic Permanent Marker is able to cover up the incorrect name for the key. All I need now is a small Command and Option sticker to drop in there and I’ll be set. If anyone can think of a decent solution to my key cap naming problem please let me know through the comments below. For some reason, I tried this and it’s not working still. Did you have to reinstall anything after changing the system preferences?